As a recognized electric contractor of Raleigh, Danco Electrical Contractors has extensive experience working with facility professionals, engineers and general contractors who are entrusted with maintaining and upgrading large industrial equipment and their associated infrastructures. Power upgrades and service changes represent a critical need for our industrial customers. 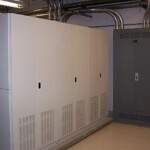 Our team of certified electricians in Raleigh can offer economic solutions for prolonging the life of an aging facility. With our company’s extensive experience in industrial upgrades, Danco Electrical Contractors of Raleigh can determine engineering strategies of upgrades and retrofits to effectively make your electrical system more efficient, as well as comply with all environmental energy standards. Not only do retrofits and upgrades extend the life of a facility and its infrastructure, it ultimately decreases maintenance efforts and improves overall system performance and reliability. Retrofits and upgrades work to lower costs as electrical systems become more efficient and less energy is wasted, and the savings retrofits and upgrades yield compared to new equipment installation can make it a wise economical decision. Contact us today for more information on increasing the efficiency of your facility with strategic retrofits and upgrades.